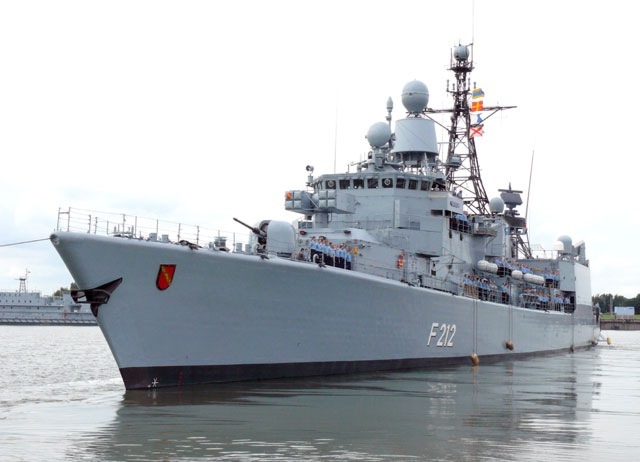 German Navy Frigate Karlsruhe, on December 25, saved an Egyptian bulk carrier from Somali pirates. The frigate Karlsruhe sailed out on December 23, from Djibouti to take part in the Operation Atalanta launched by European Union Naval Force (EU NAVFOR) on December 09. This is Operation Atalanta’s first pirate engagement. Egyptian bulk carrier MV Wabi al Arab, with 31 crew was sailing from the Suez Canal to Asia. When the vessel was off the coast of Yemen, pirates opened fire with automatic weapons at 1100 hours local time. One of the crew was injured by gunshots during the attack. The vessel raised a distress call and the frigate Karlsruhe responded immediately by dispatching an armed helicopter to the area. When the helicopter fired warning shots, the pirates withdrew their attack. The injured seafarer was picked up by another helicopter, treated for leg injury on board Karlsruhe and was later flown ashore to hospital where his condition is reported to be stable. Here is the photograph of Frigate Karlsruhe (F212) of the Fourth Frigate Squadron of the German Navy based in the North Sea port of Wilhelmshaven. More information on Frigate Karlsruhe is at German Navy. Read more from The Local and EU NAVFOR.